Colored version may need to come later, but you’re sure early with the B&W version! Re the step itself, now may not be the best time, Heather. It’s definitely a good step, but maybe not while Amanda is drunk. And Keisha, my suspicion is that Amanda won’t be in school tomorrow, being rather hung over. Actually, I think she will. If you are employed, employers don’t accept calling out hung over as an acceptable excuse. I think, like the incident with the alarm, Andi will force her to go to school. Oh Amanda, please, please listen to your heart for once and accept Heather’s olive branch… You know you want to be her friend again, you know you want to say sorry too. Please don’t let her current state of mind due to the alcohol screw this up! Aww. I hope Amanda at least sorta tries to forgive her. I can definitely understand why she wouldn’t tho’. Interesting that I was just watching a video earlier on the different types of forgiveness. From memory: There’s the type when the person never intended to do it, or couldn’t comprehend that it would have negative consequences, or if they have fully repented and apologized and all that. This basically restores the relationship fully, with no holding back. On the flip side, there’s the kind where the person hasn’t repented, doesn’t even realize they’ve done wrong or doesn’t care, and the relationship can’t be and shouldn’t be repaired (or where no good relationship existed to begin with). This has nothing to do with the person who hurt you, and everything to do with you letting go of the hurt they continue to do to you through your memories. The video calls this “release”: Not letting the one who hurt you continue to live in your head making you feel bad for the rest of your life. Because sometimes people do things over a long enough period of time that forbearance (that’s a new version, and a good one in general, actually!) stops being possible. Either you’re remembering to filter everything they say (“sky is blue!” = check out the window), or you really want to believe that they’ve realized their mistake and are the great person they pretend to be, and that will **** you over. Because they’re just that good at their lies; they even believe them 100% while they’re saying them. Anyway. A lot of people get something from some version of forgiveness! And good for them! I just will bite the hand off anyone trying to shove that down my throat, because protective rage is a thing, and I want to support people who not only aren’t ready to forgive, but who find it emotionally unsafe to do so. I have a few people I have reached that point with as I mentioned in the past. Some people just aren’t worth the energy to forgive and you know they just love hurting you so why bother. Hate as strange as it sounds, is an underrated emotion. I know there’s people about to argue with me as soon as I hit post but I do have a point. Hate protects, hate can give strength. It can devour you if you’re not careful, but in the right doses without giving into obsession it can also be used constructively. It’s the fuel to rage which at the right moments can save your life. There’s an entire town that I hate with a passion. With very good reason. Not just a person or two, but the people that tried blinding me and then the ones that protected them and laughed at me. I hate them all and wish nothing but pain and misery for them. But, there’s nothing I can do that time isn’t doing for me. So I just stand and let them destroy themselves with a slight smirk on my face. Is it unhealthy? No, I don’t think it’s unhealthy of me to hate an entire town for their actions. And neither will I ever forgive. The time to forgive would have been during the fifteen years where the people were trying to kill me, put me in a coma, watching the entertainment of a child begging for mercy and help, and making sure the child can’t even escape the daily beatings. That was when I should have gotten apologies and people working to stop it. Hatred was beat into me, and there’s nothing that can be done to change that. A. Beth and GallowsNoose, power to you both. Forgiveness is great for many people, but trying to forgive before the time is right can hurt a person more. And sometimes, the right time is “after the heat death of the universe”. As always, I’d also caution people about accepting any simplified model such as this as the only way to think about some complex facet of human behaviour. It can be useful, it can provide good insights, but the map is not the territory. This three-category map is considerably better than any one-size-fits-all definition of forgiveness, but it too is missing some large and significant aspects. Moreover, the prescription for what you should do if your situation does fall recognizably into one of the three categories is still way over-simplified. This is only a problem because when people hear a nice simple model like this, they want to believe it, they try it out, and then when it doesn’t fit perfectly they either think there must be something wrong with them that they can’t make it work, or they reject the whole notion. The truth is, models are useful tools for thinking about your own situation or someone else’s; they may help you come to new insights. But don’t expect more from them than that; despite what lecturers on the self-help circuits would have you believe, they are never magic panaceas! I just read something on Facebook about the news being less depressing than some of the comments below it. This is a very good model. I have one brother who I cannot do forbearance with. I am past the hatred, but I want only the most superficial relationship. I have a past where I could easily hate the whole area I grew up in and my brother was a big part of that abuse. Kinda like the Dominic Deegan anti-fans, who decided to follow the comic for years out of pure annoyance/rage/hate. You’d think they’d move on to things they’d enjoy instead of just sticking around to say negative things about something other people enjoy. I was part of the Dominic Deegan Anti-Fans. In my case, I had already spent so much time, I had to see how it ended. I used to enjoy it very much, then the horrible writing kicked in. The horrible, horrible, ego stroking writing. It didn’t help that sometimes he sent people to get after the anti-fans for him and try guilting us away. Ugh, Amanda should be apologizing instead. Hoping she realizes and does that next strip. I stand with pointe4Jesus above, any real apologies should wait until Ananda sobers up. Amanda may not clearly remember anything that happened while she was intoxicated. This is for all the “Heather should wait until Amanda sobers up” people. While that might be true… Heather is 8 or 9. There is a very good possibility she has no clue that Amanda isn’t in her right mind right now. To be fair. Heather shared a secret that she wasn’t supposed to. One that was super personal and none of Selkie’s business. So this is needed too. I’m with LadyObvious here. They both have been in the wrong and need to apologize. Heather did it first, which is fine especially considering she wronged Amanda first. But I’m glad this is happening, Amanda has been retreating from people far too much and she doesn’t need to be isolated even at her own hand. I’be been marathoning this comic for the last few days and I’ve finally caught up. I get that apologising was the right thing to do but I think Amanda should really have apologised first because Selkie had every right to know and in fact she has many apologies to hand out. Her poor behaviour has gone on for too long unnoticed because she’s had a difficult past and it really needs to be reckoned with. LADY OBVIOUS I disagree with what u r saying; it was completely Selkie’s business and Amanda had no justification or reason for her entirely”misplaced” anger. I think if Amanda decides to accept the apology then great but she should say sorry too. 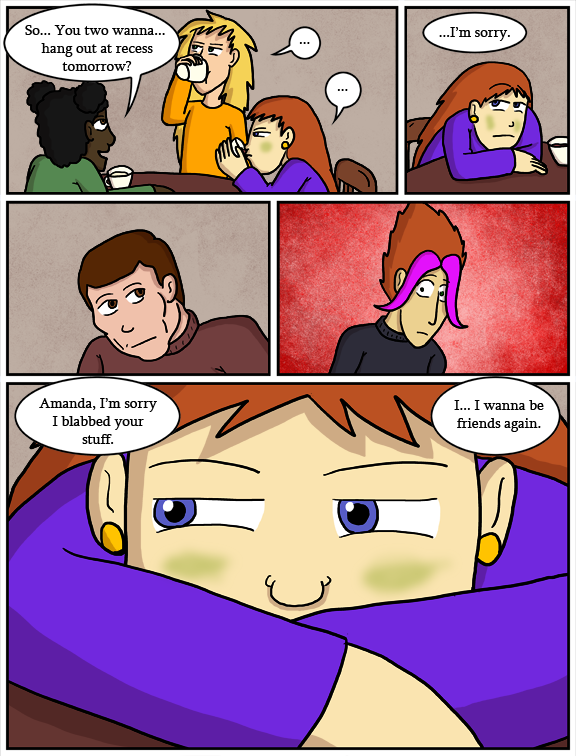 Whether you like it or not in this particular situation, Heather wronged Amanda first. Was it Selkie’s business? Yes, it certainly was. Was it Heather’s job to spill the beans? No, not at all. What happened to Amanda is hers, talking about it would help her, it was the crux of why she is so foul at times. But it was Amanda’s job to talk about it when ready, not Heather’s. Amanda was wrong in her reaction, but it was understandable. And the person who commits the sin first needs to apologize first. As for everything else, Amanda should apologize, when ready to do so. I like your opinion but don’t you think that seens as Amanda has done nothing but give selkie a bad time and this was Heather’s way of apologising for all the nasty stuff they or at least she had done to selkie i think that if anything, Heather was doing Amanda a favour. Amanda was never gonna actually say sorry or anything so Heather kinda lifted the weight and helped Selkie see a (though not quite justifiable) perspective as you say . That’s kinda how it seems to me. Sure Selkie gained a new perspective of Amanda. But it isn’t Heather’s secret or either girl’s business than Amanda’s. Ladies and Gentlemen, men and women, slave and free, children too; step right this way and spin the Wheel of Fortune, (cue music, Orff’s “Oh, Fortuna”). Round and round and round it goes, how it plays with us Heaven knows. Who is the lucky lady tonight? Now we are playing for Amanda’s soul, what will the wheel Reveal? Happy drunk, mean drunk, sad drunk, maudlin or morose? Take your pick, and place your bets, who will get lucky with the Wheel? I just spin the wheel, folks,I can’t tell if she’ll laugh, cry, or lash out. Now! How will YOU bet? Oh my gosh, from the thumbnail the nose in the last panel looked like an evil smile. Hi, just wanted to say that I just discovered your comic a couple days ago, and I’m hooked! I absolutely can’t wait to see how it all plays out – you’ve earned yourself a fan! I don’t care who or what started an incident people in general need to apologize regardless of the order things happened. As for forgiveness, my theory is forgiveness is giving up the attachment to the offense or hurtful experience. It does not mean you have to be friends, trust, associate with or even like the person or people who hurt you. It is simply a refusal to let the attachment to dictate or control one’s life/ attitude. So, her cheeks are green instead of red, why? Because she isn’t feeling so well. With all excuses made to Selkie for the phrase, Amanda is green in the gills.